A massive 8.9-magnitude quake hit Japan on March 11th, resulting in thousands of injuries and deaths, and a resulting tsunami hit along parts of the Japanese coastline. The damage was extensive. 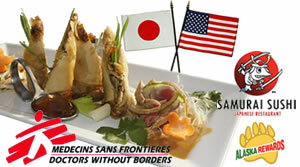 With todayâ€™s Alaska Reward we are teaming up with Samurai Sushi to support Doctors Without Borders. Samurai Sushi has created a masterful appetizer they call the 3-11 Tsunami Roll. The appetizer is deep fried and stuffed with pork, shrimp, bamboo, and mushrooms, all covered with a succulent wine sauce. The flavor starts out mild and ends with a kick. All proceeds from this Alaska Rewards goes to the non-profit Doctors Without Borders. They have sent medical teams to support the earthquake and tsunami response in Japan. There teams are assisting with 9,200 people in 20 centers who needed medical attention. 87% of the money given to Doctors Without Borders goes directly to those in need, ranking them one of the lowest overhead non-profits in the world. Alaska Rewards and Samurai Sushi is honored to be able to assist the people of Japan in their time of need. Your purchase of this Alaska Reward will get you the 3-11 Tsunami Roll at Samurai Sushi and all $15 will be donated to Doctors Without Borders. Helping those in need has never tasted so good! Expires April 1st, 2011 Limit 5 per person. Valid for one (1) 3-11 Tsunami Roll only per voucher. Must use in 1 visit, no cash back. Not valid with other offers.